Seven years ago, when I decided to implement my crazy idea as a retirement hobby, I was concerned about how it would be perceived by the bartenders I would interview. For it to be successful, I needed them to answer my questions about what makes their bar different, comment on the tavern’s regulars and offer info on their own background. Would they dismiss these inquiries as some old guy with idiosyncratic tendencies or support the idea that highlighting the history and distinguishing factors of Portland’s many watering holes was a cool idea? 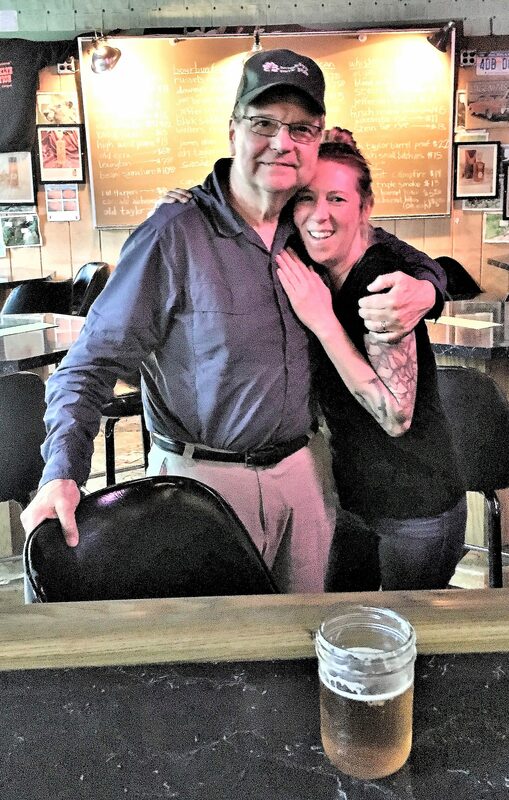 Well, my trepidation was unnecessary when the first bartender I interviewed became one of the most memorable. 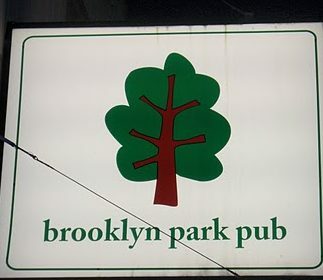 Phoebe Newcomb was behind the bar at the Brooklyn, a great little Southeast neighborhood pub – and still one of my favorites after seven years. 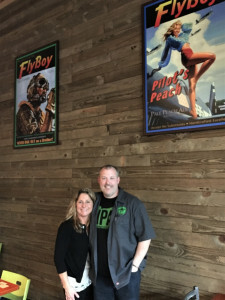 She told me about the Whiskey Club, talked about the tradition of serving their draft beers in Mason jars and to check out the woodchuck posters…..
Phoebe’s gift at my first stop on the Tour…. 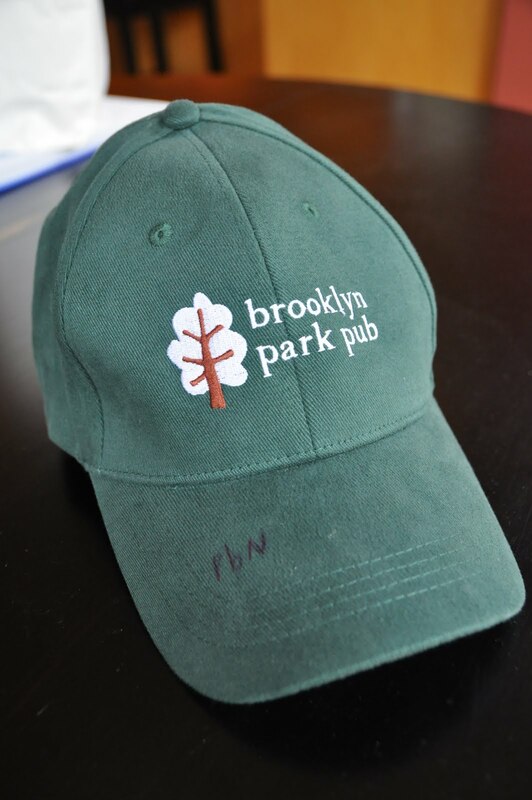 When I told her that the Brooklyn was my first of what I hoped would be many bars on the tour, she gave me a Brooklyn Park Pub cap and signed it. I still remembered her charming and distinctive laugh that echoed through the bar as she was interacting with her customers. 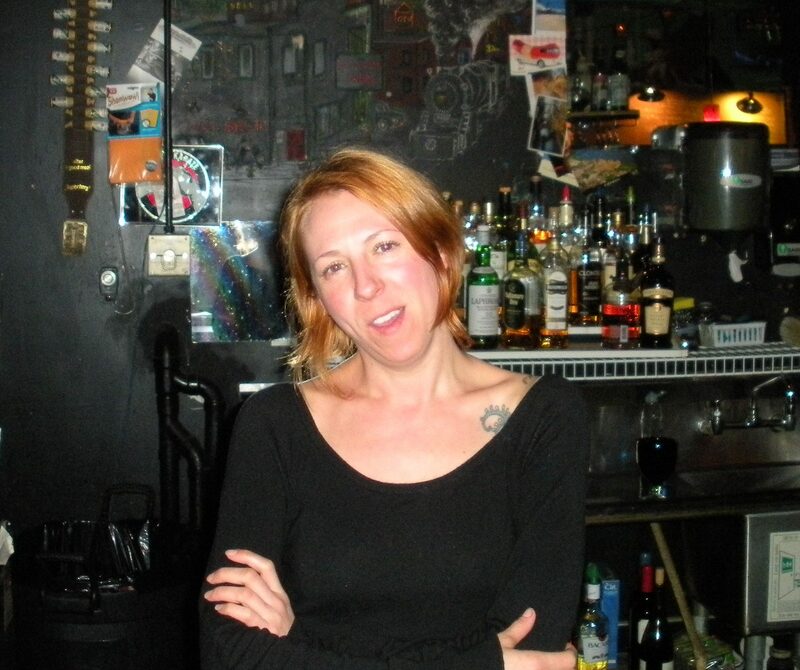 In July, I was reviewing Willamette Week’s Best of Portland issue and discovered that third place for Best Portland Bartender was none other than Phoebe, who now works at the Landmark Saloon besides the Brooklyn. I was not disappointed in Phoebe’s reaction when I again told her my story and that I had returned to thank her for the positive kickstart to Thebeerchaser’s Tour. I donned the treasured BPP hat and one of the regulars took our picture. 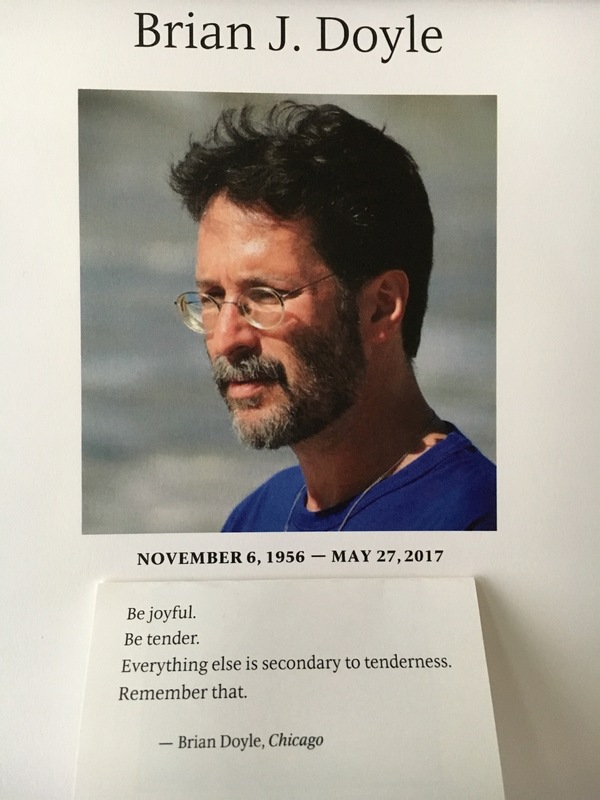 Brian Doyle – His Legacy Lives On – As followers of Thebeerchaser blog and those who appreciate good literature know, we lost a great human being in May with the passing of Brian Doyle who succumbed to brain cancer. Brian was prolific, authoring about thirty books including novels, collections of short stories and penetrating essays, was the editor of the award-winning Portland magazine published by the University of Portland and a gifted speaker. 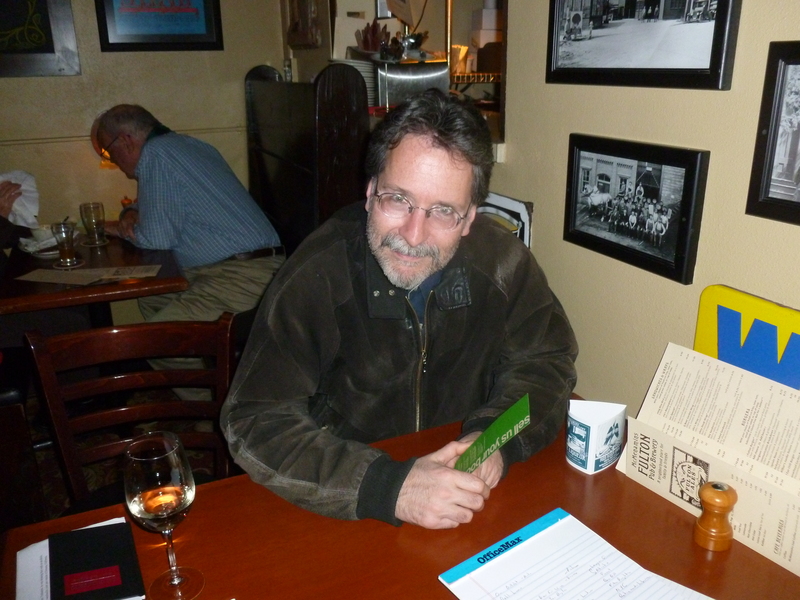 I met Brian in 2013 when I informed him by letter that I had named him my eleventh Beerchaser-of-the-Quarter and all it required for him to receive the “award” (a pint of beer) was to meet me for an interview at the saloon of his choice. He chose the Fulton Pub. 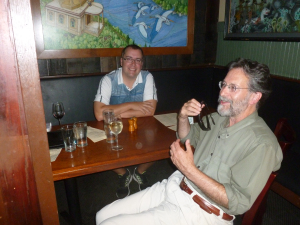 We had drinks after that on a number of occasions and corresponded by e-mail in which he never failed to demonstrate his positive view of humanity, his religious faith and his imaginative and fanciful sense of humor. I was therefore pleased when in July I received an e-mail request from the Design Editor of Melbourne Catholic Magazine in Australia requesting permission to use one of the pictures posted in a tribute to Brian in the blog shortly after his passing. I laughed when I found out that they selected the one I took at the Fulton Pub the first time we raised a mug. 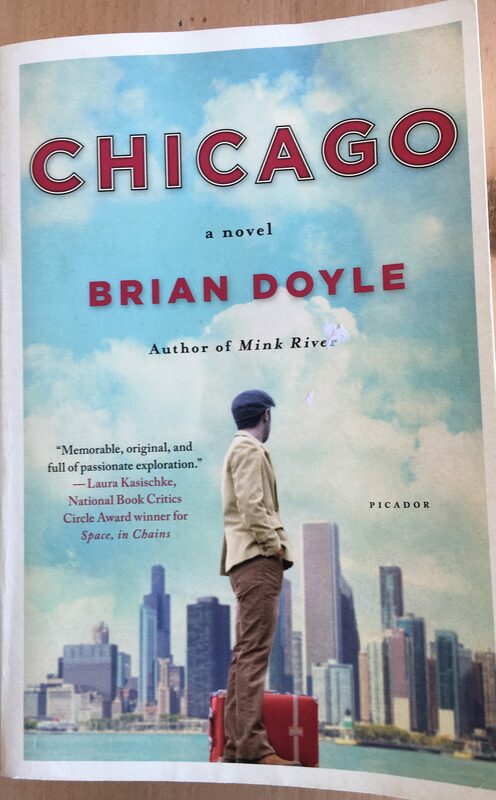 I recently finished Chicago the second to the last novel which Brian wrote in 2016 and it’s my favorite – it’s a perfect example of his keen observations of nature, people and events, some of which many would view as trite or inconsequential. I’m sure that Brian could have ridden the #33 Tri-Met bus (McLoughlin Blvd…..) from Oregon City into Portland and have written a lengthy and entertaining essay (with very long sentences…..) on what he observed that would have been a good read. You should read Brian’s account of Chicago – his descriptions of Chicago White Sox games and players and the Chicago Bulls, gyros, meeting former NBA great Artis Gilmore on a walk, street basketball, Lake Michigan and dribbling his “worn and shiny basketball” through miles and miles of the urban landscape. 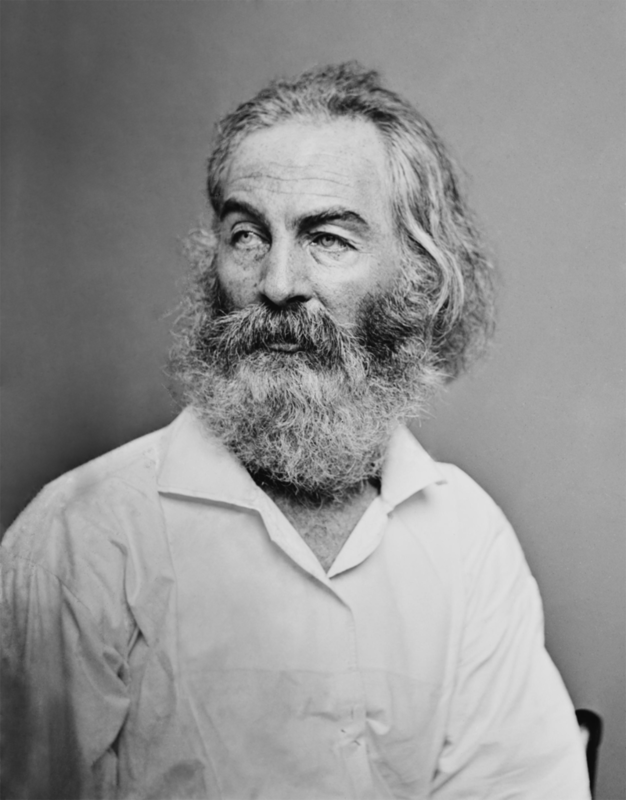 And as in Martin Marten, one of his main characters is an intriguing, erudite and marvelously resourceful animal – this one, a talking dog named Edward who had a strong and enduring admiration for both Abe Lincoln and Walt Whitman. 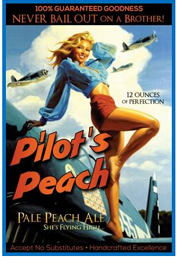 Pondering Those that Come and Go – I am saddened to report that one of Portland’s most iconic breweries has “chugged” into the sunset. 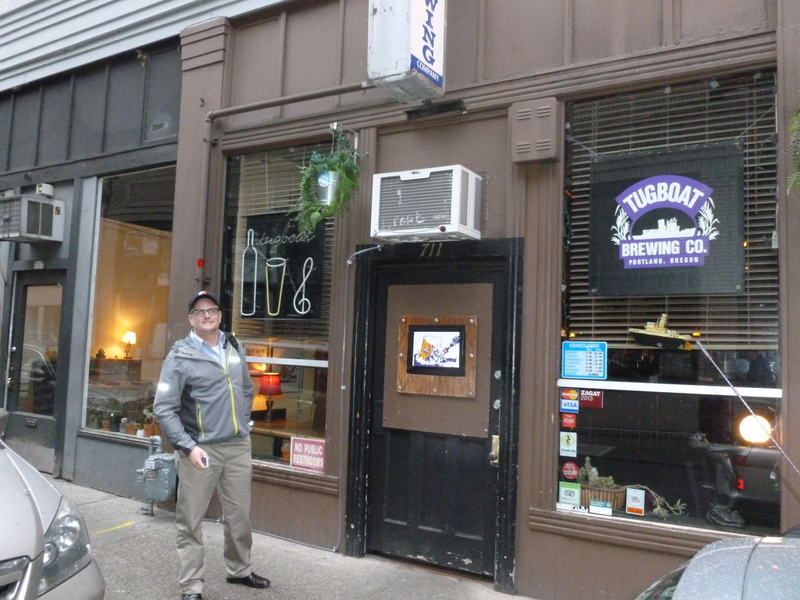 The Tugboat Brewery, which I visited with former Portland Mayor, Sam Adams in March 2013 and was downtown Portland’s oldest craft brewery, was severely water-damaged when the ceiling of the apartment above it in the Stewart Hotel collapsed. While initially, the plan was to open after repairs, the damage was evidently too extensive. 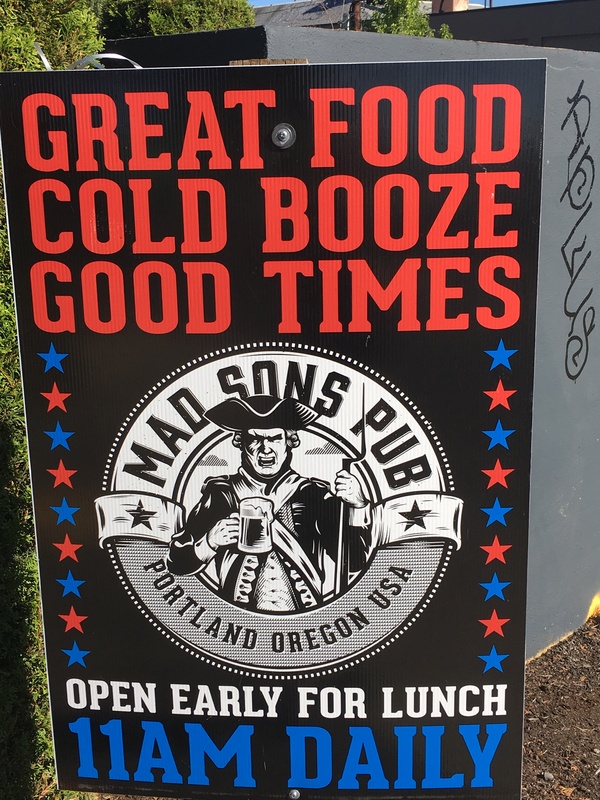 Similarly, MadSon’s Pub closed in August although no reason was supplied other than rumors of electrical and HVAC issues which would have required extensive repairs. MadSon’s was a cool and spacious neighborhood-type bar on the near Eastside which had a nice ambiance and a superb brunch. My first visit was with Portland lawyer, Jack Faust and his clan. Add the Hop & Vine on North Killingsworth to the list of closures after eight years of serving beer and wine to its loyal customers. And, of course, the historic and famous Lotus Cardroom, in downtown Portland is also gone in the name of development. And Some That Thrive….! 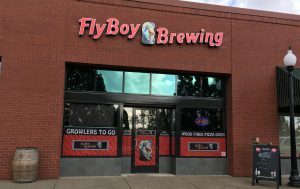 – I am happy to report that on a recent and one of many return visits to what has become one of my favorite brewpubs – FlyBoy Brewing in Tigard, Mark Becker and Michelle Faubion report that their expectations have been exceeded since the opening earlier this year. The City of Tigard has been very helpful in the permit process and they will be opening a new patio in front of the pub in several weeks. Drop by and try some of the thirty beers on tap and the great food on their menu. Happy Hour is from 3:00 to 6:00 each weekday. Thebeerchaser Goes Civic – I was pleased to be able to make a repeat performance relating the story of Thebeerchaser blog and why it has become a wonderful retirement hobby – this time in August at the Lincoln City Rotary Club. 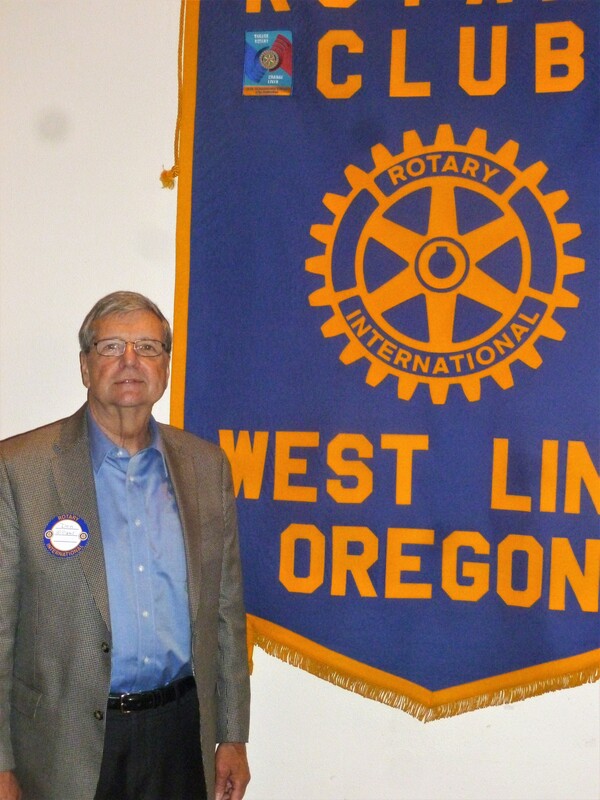 I made the same presentation to the West Linn Rotary Club in 2016. Farewell to a Portland Legend – Born in Hot Springs, South Dakota, Jack Stutzman died in Portland last week at the age of 77. He graduated from Oregon’s West Linn High School and found his niche in the bar and restaurant business after Army service. His first tavern, the Green Spot was followed by The Local Gentry, Gassy Jack’s and he then purchased the Hoot Owl in John’s Landing in 1973. 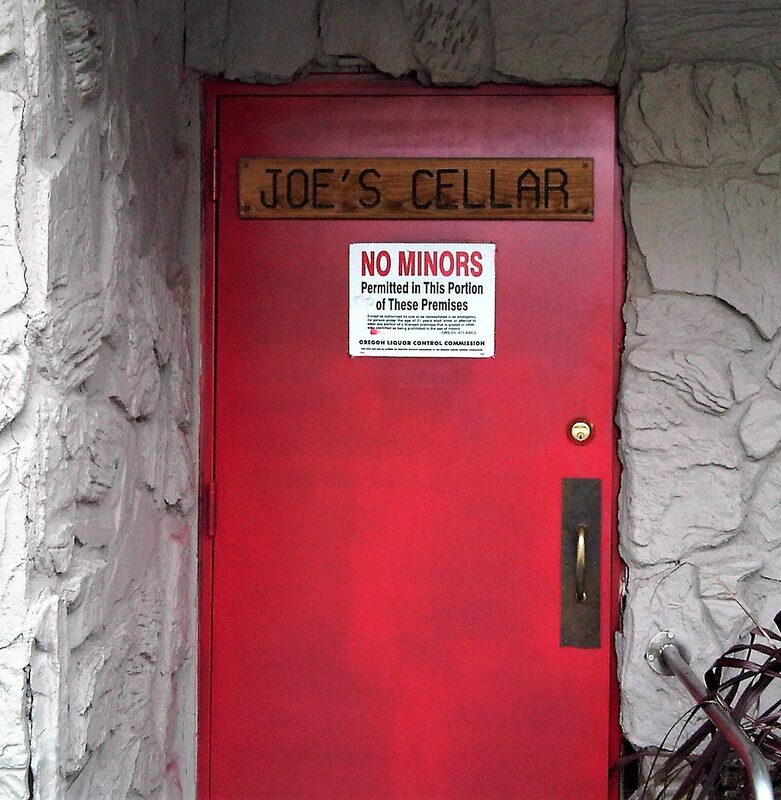 The Gap was one of Thebeerchaser’s first watering holes visited when this blog started in 2011 with Beerchaser regular, Jack Faust. 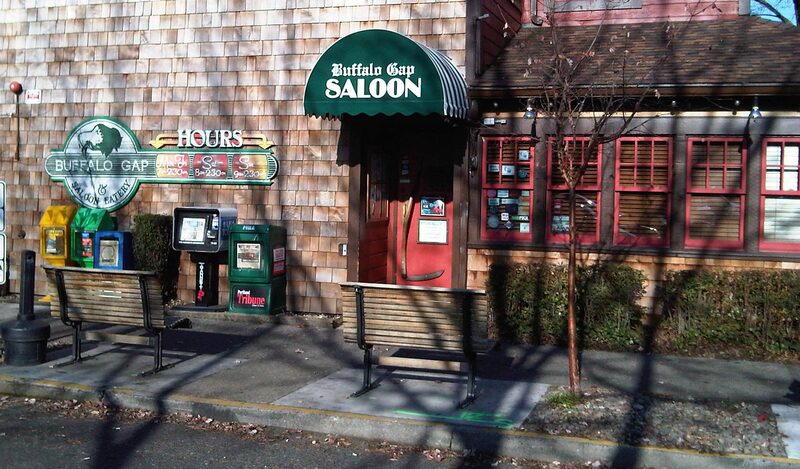 Drop by this great saloon which still thrives on SW Macadam and toastJack Stutzman’s memory.